Like most wildlife related questions the answer to this one is not all that simple. Hunting is just one aspect of a deer’s life and you need to be able to look at the bigger picture to find a possible answer. 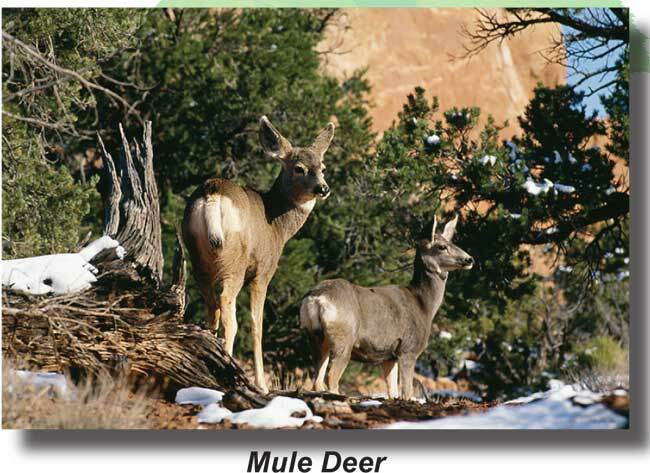 In Idaho we have two species of deer, the mule deer and the white-tailed deer. Even though the two types are similar, the way they each are programmed can be a factor in itself when it comes to surviving or not. Because of the differences between these two types of deer, Idaho now manages them separately. Rather than looking for a magic date on the calendar for survival, we need to look at the deer itself and the condition of its habitat to predict survival. Habitat is not only where the deer lives, but what it has to eat and drink and the various types of places it needs to survive throughout its life. Hunting is a management tool that is used to help regulate wildlife populations so that they fit within the habitat that they have to live in. Even without hunting there is no guarantee that any deer is going to survive from year to year. Whether a fawn has had plenty of the right stuff to eat over the summer and fall is very important, even if the doe is around. The other major factor is the severity of the winter. Even healthy deer can die during a hard winter. Where doe harvest is allowed, game biologists usually try to set hunting seasons late enough so that if a fawn is orphaned, it will survive if conditions up to that point have been good and the winter is not too long or cold. Just like human children need adults to teach them about the dangers of the world, so do deer. As long as a fawn has some deer around to help it learn about avoiding predators and making it to a good spot, then it should do okay. 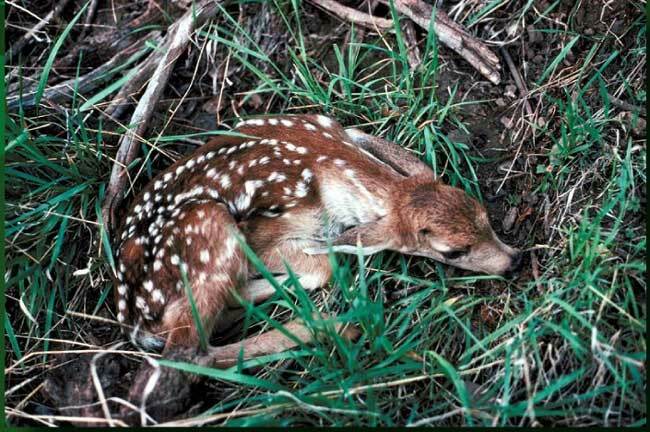 Even when most things are going right for deer, biologists usually expect some fawns to die. If conditions are really bad, most will die. Wildlife managers try to manage for healthy populations of animals. Sometimes this means that in order to protect the habitat, the number of animals must be adjusted. As long as hunters follow the regulations that have been set, the population should be okay and what is harvested becomes a matter of personal preference. Some people hunt deer for their big antlers, some for meat on the table, others for both. Most deer are born with white spots. The spotted coat looks like patches of sunlight falling on the forest floor. Fawns aren’t very mobile, so the mother doe hides the fawn when she has to go feed. The fawn’s only defense is its camouflage, and it will remain perfectly still, even if predators approach. Spots are a type of camouflage called disruptive coloration. Disruptive coloration is a way of confusing the eye. It breaks up the solid outline of an animal’s body so that it is harder to see. As the fawn grows and begins to walk around with its mother, the spots would actually draw predator eyes. The spots begin to fade and completely disappear by the fawn’s first winter. Use the paper punch to punch out 100 holes from each of the papers and the newspaper. Lay a different sheet of the classified ads on a table and spread the paper circles over the newspaper. Pick up the circles, one at a time, for thirty seconds. Sort and count the circles you picked up. Which color got picked up the most? The least? Did your experiment illustrate disruptive coloration camouflage? ← I noticed on the USGS earthquake web page that the Challis area has had 208 earthquakes so far this year. Only a few have been over 3.0, but that still seems to be a lot of earthquakes. Do smaller earthquakes ever give a prediction of a larger one in the future?